We have come across a very, very useful app today on Android, it’s called DeskSMS and it lets users send and receive text messages from their desktop/laptop using a web browser, Gmail or Google Talk. We talked about WifiSMS for iPhone yesterday, a jailbreak tweak that let you access iPhone SMS.app from desktop web browser over WiFi. While that tweak required a jailbreak – something not every person is ready to do – this Android app we’re featuring today doesn’t. It is also much more elegant and works far more efficiently. The app is called DeskSMS. It is developed by ClockworkMod, the same developer behind the popular ROM Manager app which every flashing enthusiast has installed on their droid. 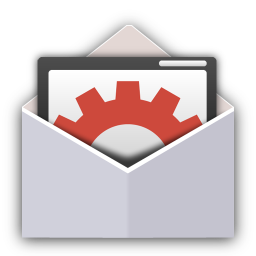 What DeskSMS basically does is forward your text messages to Gmail, Google Talk (or other supported IM clients) and DeskSMS’ online service. Once installed, you set it up by adding your Google account and choosing which services you want DeskSMS to forward your texts to. 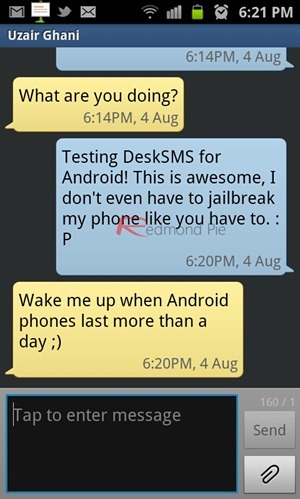 DeskSMS forwards your text messages to your GMail, Google Chat, and DeskSMS Chrome extension! And if you reply back, the recipient gets a text from your number! Download DeskSMS on your phone, and then use your an IM or email client from your XOOM or other Android Tablet to send text messages! Forwarding your texts to your Gmail inbox/Google chat lets you reply to the text directly from there. Its integration with Gmail/Gtalk is excellent but, I know this is a personal thing, syncing your text messages with DeskSMS’ online servers is the best option since you can avoid cluttering your email/IM by keeping texts separate. This can be enabled by choosing the Sync SMS option from the app itself. 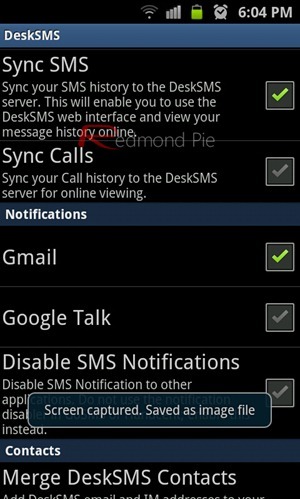 Once Sync SMS is enabled, you simply log on to clockworkmod.com/desksms with your Google account from your desktop web browser. We highly recommend enabling Sync Contacts with Google account from the web service so you’ll know which person is texting you. We’ve personally tested this on a Samsung Galaxy S II and can confirm that DeskSMS works as advertised. DeskSMS is a free app for Android smartphones. It is currently in open beta stage, so expect it to be a paid app in the near future. Grab it while you can, folks!